How bad is it? Will Cybersecurity get worse? The problem is one of business decisions which means a little bit of known knowledge and a little bit of psychology, it does not have to do with technical capabilities. What is the worst problem that can happen to you in your business? Lose all data? I.e. without a backup! That is what can happen with a phenomena called “Ransomware”. Remember from Bruce Schneier’s Psychology of security 70 % of us do not believe that it is wise to spend money on risk avoidance, there are other things that we as humans naturally tend to do. So the bottom line? Ransomware is not going away. Criminals will make more money and make better Ransomware. I am sure you reading does not have problems, and is paying just enough attention to deny the Criminal any actual pound of flesh (data to exploit). 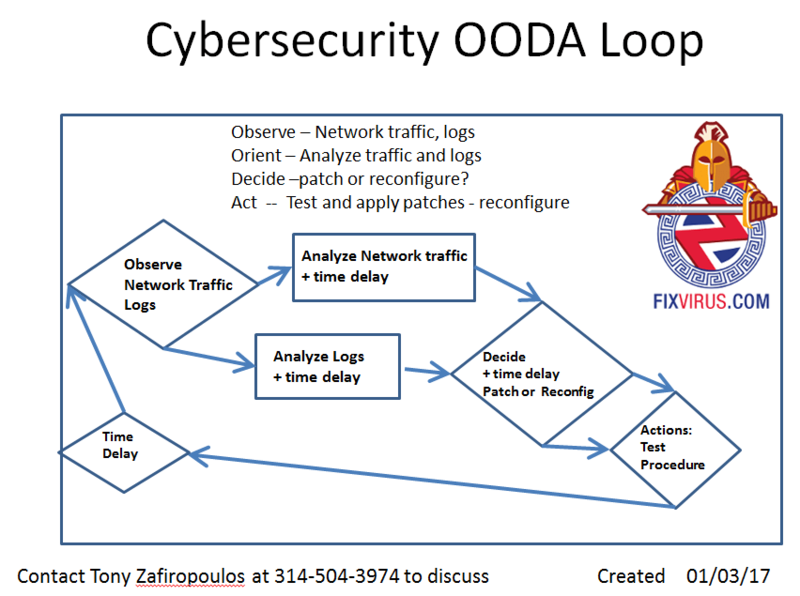 The key to improve your OODA Loop (Observe, Orient, Decide, and Act ) is to reduce the time delay and to actually apply patches or reconfigure devices properly. The only way to ensure that this has been done by your team is to test them with an outside testing person/agency. There are many stories of Ransomware failures, and here is another one(01/20/17): Fox2Now (Channel 2 – Saint Louis) Saint Louis Library system got 1000 systems infected with Ransomware. Because once 1 system is infected it could affect other systems on the network. In this story there will be no payment, as the systems will just have to be reinitialized (reinstalled from scratch). But something is wrong there so it will possibly happen again until the process and procedure failure is rectified. Contact US to help you fix your processes to prevent ransomware. Previous Previous post: Sure Connect ABC device to Internet!!? ?